Comic collector , movie fan, tv and gaming enthusiast. Thriving to bring new experiences from my world to everyone on BAMFAS. The gaming world is one that evolves at such a rapid pace that everything needs to constantly fight and writhe to be able to stand a chance, as a result it’s always amazing when games come about that don’t attempt to even meet the bar in gameplay when everything else stacks up so well. The question then becomes quite simple, how does one go about mastering a visual engine, great supporting art and control and then completely abandon the gameplay, the first thing that should come to mind in a new title is variety or the sense of choice even though in reality no game offers total choice, just a fair illusion to make people comfortable, a perfect example is GTA where players can fool around all they want but in the end the only way to complete the game is to go through the steps in linear fashion. The latest victim of this is Wanted, a movie license and comic license by Warner Bros., the game has many things that sell it as a worthwhile title but choice isn’t one of those items. Instead Wanted plays like a badly scripted action sequence with the same idea of “the player will jump behind the box, crawl around the corner, kill a knife wielding assassin, then shoot the guy with a curved bullet behind the head to get past the start of the section, lets then have a series of a duck and cover points pre-scripted and then have them go through while maintaining a very open looking area but with fences so that no one gets the idea to go outside of the pre-arranged trail.” The game could have offered something more, they could have opened up the levels, maybe made a variety of enemies and on top of that offered the chance to team up online and make use of the obvious development time invested into the special attacks. It’s easy to pick apart the game when it’s all said and done though, the team did a decent effort to make things happen but the voice that was in this project pushing so much control and linear play killed the game. 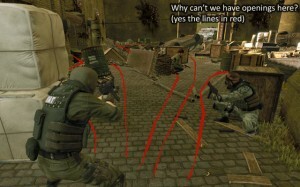 Why not let players jump over any car, over any box, why not let them climb and shoot out from a balcony, why not let them hide behind non-standard pillars or give them the chance to quickly dash to other locations other than just a,b and c. players like to make a fire fight interesting, they don’t want to be able to see straight through the challenge and pick off everyone in a basic manner or be able to avert other challenges such as the snipers, they’re paying $60 for a thrill and a memorable experience, not to see how well someone scripted a mediocre set of repeating challenges. Linear gameplay is extremely dated, it doesn’t even work for movie ports because no one wants to follow the same path they did in the film, the Spider-Man titles fought against this issue after the original and have been doing decent improvements over time although they’re not perfect at all. The idea that you can do other things on this path of destruction while living in the story, instead of watching cut-scenes why not make it possible to dive more into the control of how things pan out. People only like driving in a straight line for so long before it gets frustrating to no end. At this point in gaming the players are getting sick of this car ride and want out now, hopefully producers pay attention to that and let their devs roam free with how to re-approach play mechanics.